I filmed this video in Zihuatanejo, Mexico, a small fishing village in the state of Guerrero. The fish there is so fresh and delicious that I couldn’t resist trying out this simple, tasty, traditional Korean recipe, domi-yangnyeom-gui. 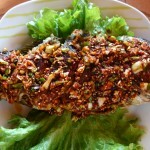 It’s fried fish, but what really makes it stand out is the seasoning sauce, where the a mix of savory soy sauce, nutty sesame oil and seeds, and fresh green onion nicely compliments the fish. This is a very traditional way of enjoying fish in Korean cuisine. Like many Korean side dishes, it’s a little salty, so you always need to pair it with rice. You can make this with red snapper, yellow corvina, pogy – not just black snapper like I do here. You can also broil, roast, or BBQ the fish, if you don’t want to fry it. Next time you get some good fish, try this recipe, and let me know how it goes. Take the fish from the fridge and pat dry with a kitchen towel. Sprinkle the flour on both sides of the fish. Heat up a nonstick pan and add the cooking oil. Cook the fish until the bottom turns golden brown. It’ll take about 20 minutes over medium heat. Turn it over with a spatula and cook the other side for another 15-20 minutes until that side turns golden brown, too. Combine the seasoning sauce ingredients in a bowl. Transfer the fish to a plate and place the seasoning sauce over top of the fish. Serve with rice, kimchi, a soup or stew, and more side dishes if desired. You can use this method to clean and salt your fish in preparation for making domiyangnyeomgui, or you can simply panfry or BBQ the fish without any seasoning sauce. When I buy a lot of fish I’ll clean and salt them like this, put them all in the freezer, and then thaw them out as I need them. Scale the snapper with your knife. Cut along the underside of the fish, from the bottom of the head almost all the way to the tail. Score the side of the fish diagonally 3-4 times. Wash and pat dry with paper towel. Sprinkle salt on both sides of the fish evenly. Put it in a plastic bag and keep in the fridge at least 1 hour. You can keep it in the freezer if you don’t use it soon. Posted on Thursday, April 18th, 2013 at 11:39 pm. Last updated on February 15, 2015. Posted September 19th, 2018 at 4:16 am | Log in to reply. Made this using salmon fillet (unfortunately, I don’t have a nice whole fish on hand) and it came out really nice! The sauce is super simple but does wonders to accompany the fish itself as well as the rice I served it on. Of course, I’ve made a lot of other recipes you’ve shared, and I’ve really been getting into Korean cooking as a result! 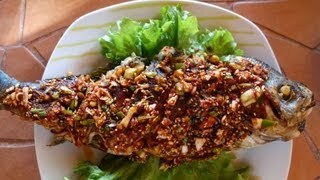 My brother really loves kimchijeon and I’m looking into getting what I need for bindaettok soon! Thanks for posting all these recipes! Posted May 7th, 2018 at 1:46 pm | Log in to reply. Yesterday, the peddling fishmonger came by and I bought a couple of pounds of Tilapia from him (the only fish he sells). Fried one for supper and had it with Yangnyeomjang. The best Tilapia I´ve ever had! Posted January 1st, 2018 at 11:23 pm | Log in to reply. Can a lingcod be used for this recipe? Any advice would be great, thank you. Posted January 18th, 2018 at 5:51 pm | Log in to reply. Or how about rock cod? Can I use that type of fish for this recipe? Posted November 9th, 2017 at 4:35 am | Log in to reply. Korean Style Fried Red Snapper with Seasoning Sauce (Yangnyeomjang) & Seafood “Paprik”-Malaysian’s dish. My family dinner tonight. Thanks Maangchi.. This fish very tasty. Posted May 13th, 2016 at 11:50 pm | Log in to reply. I would like to use Mackerel for this recipe. Do you think that is ok? Posted May 17th, 2016 at 3:53 am | Log in to reply. Yes, mackerel will work well, too. Good luck! Posted February 10th, 2015 at 1:43 am | Log in to reply. My fish was ready at 15 minutes (both sides). Me, my dog, and two cats enjoyed the spicy, moist, flaky fish. We saved a taste for my Mom and Dad. Posted October 7th, 2014 at 12:02 am | Log in to reply. Posted October 8th, 2014 at 7:16 am | Log in to reply. Great! I’m looking forward to your feedback! Posted November 26th, 2013 at 4:28 pm | Log in to reply. Posted October 8th, 2014 at 7:17 am | Log in to reply. Yes, saury will work well, too. Posted May 2nd, 2013 at 11:30 am | Log in to reply. I was able to download your kindle recipes on my android. Thank you for sharing this to us. I was hoping that I would have a copy of your recipes. Thanks again and God bless…. Posted May 4th, 2013 at 8:13 am | Log in to reply. Posted April 30th, 2013 at 2:55 pm | Log in to reply. I’m reading your web site and watching your youtube videos. Today, I made your fish recipe whit little differences. If you give permission, I want to publish this recipe on my own blog site, of course with your link. And after that, I would like to publish your recipes which I try. If you give permission, I will be glad you. Best wishes. Posted May 4th, 2013 at 8:16 am | Log in to reply. “I want to publish this recipe on my own blog site, of course with your link..” Thank you, yes you can. Posted April 30th, 2013 at 2:48 pm | Log in to reply. Hi Maangchi, I made this with boneless snapper fillets. It was much faster to cook and easy to eat, and my husband loved it!! The sauce is sooooo good. Thank you for the recipe! I made broccoli salad too! Posted May 4th, 2013 at 8:17 am | Log in to reply. Boneless snapper fillets sound awesome! Posted April 19th, 2013 at 8:31 pm | Log in to reply. Hi Maangchi. Your video just reminded me that I need a vacation soooo bad!! It looks so relaxing, listening to the ocean and birds. I can just imagine how good the food tasted in that type of serenity. The snapper looks so fresh and delicious. Posted April 19th, 2013 at 12:50 pm | Log in to reply. Posted April 19th, 2013 at 1:02 pm | Log in to reply. and i will also put the sauce in advance before baking it and add additional gochujang and instead of sugar i will use honey! :D is it ok? This recipe was originally posted on April 18, 2013 at 11:39 pm by Maangchi. It was last updated on February 15, 2015. The video was watched 545,870 times on YouTube & has 6,332 likes!